I really don’t like wasting food. I also hate eating leftovers. You would think those would be contradicting statements but when your husband loves leftovers and takes them to work, no food gets wasted! I had leftover marinade from my soy sauce egg and while my husband will take a lot of things to work, there’s not much to do with straight up soy sauce. I didn’t want to throw it out and I had just found fresh udon noodles, so I decided to make an udon stir fry. I needed a protein so I went looking through my well-stocked freezer (I’ve been bringing back loads of goodies on my trips to the States!) and came out with Jacks Gourmet sausages. 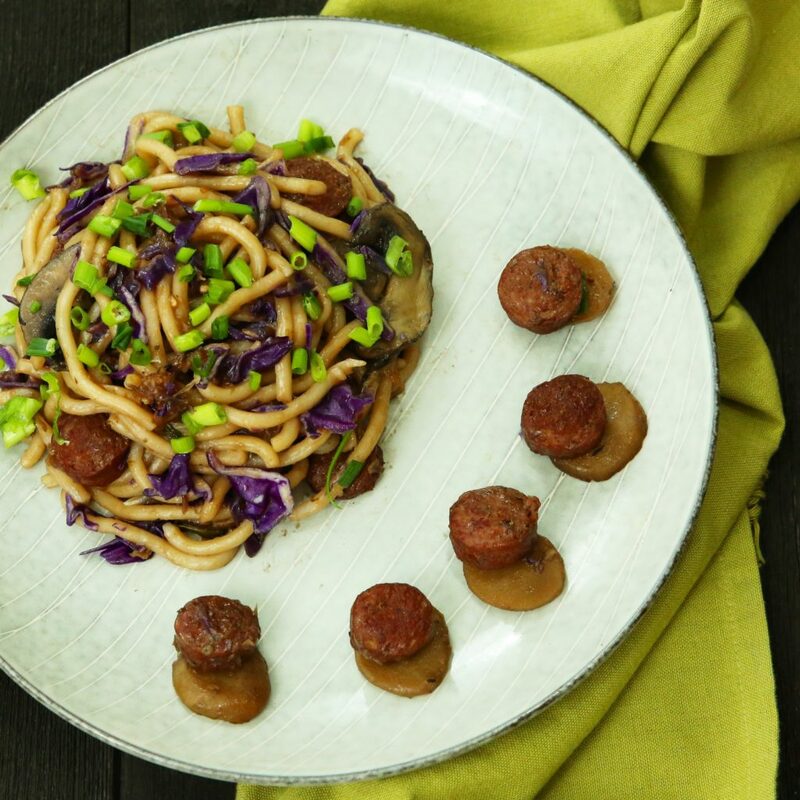 Since the marinade was leftover, the noodles take around 3 minutes to prepare and there was no prepping or cleaning of the protein, all that needed to be done was cutting up the veggies so this dinner really is the perfect solution for a quick weeknight dinner. Prepare udon noodles according to package directions and set aside. Heat up a sauté pan over a medium heat and add in the sausages. Fry them until golden and crust, remove to the side. In the same pan, with all the oils from the sausages, add in the onion, garlic, ginger and scallion whites. Sauté until golden, 2-3 minutes. And in the mushrooms and water chestnuts and sauté until the mushrooms shrink considerably. Add in the cabbage, marinade, cornstarch and honey and mix. Simmer for 3 minutes to allow the sauce to thicken. Add in the sausages and noodles, give it a quick stir to coat everything and serve. Check out the soy sauce egg recipe!